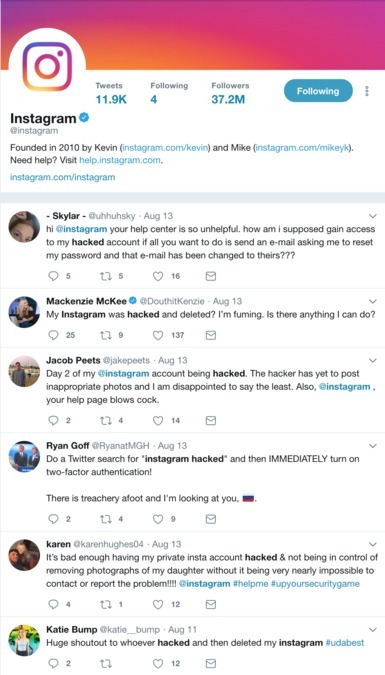 Instagram users are claiming a weird hack is locking them out of their accounts, then changing their log-in information. According to Business Insider, users took to Twitter to complain about the hack changing their username, profile photo and linked email address. Some cases report hackers changed user profile pictures to "animated stills from Disney or Pixar films, or just deleting accounts altogether." Even stranger, "hackers changed the associated email to one with Russia's .ru domain," according to Business Insider. According to Mashable, nearly 900 accounts on Twitter have tweeted about the hack . Users say recovering their account has been difficult because their log-in information has been changed and that Instagram isn't doing much to help. "We are aware that some people are having difficulty accessing their Instagram accounts."